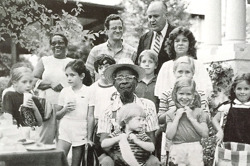 In the fall of 1975 Central Gardens’ residents were sitting on the edge of their collective seats in waiting for the Memphis City Council and the Planning Commission to vote on neighborhood zoning changes as outlined by William S. Pollard Consultants, Inc. and their improvement plan. Neighbors in support of the plan - which included the creation of bicycle lanes, a walkway system, new street signs and entrance gates, and new parks and an educational center - saw it as critical to preserving the small-town and family-orientated integrity of the neighborhood. The University Towers on Central Avenue. However to the satisfaction of most of the neighborhood, the City Council and the Planning Commission approved the “back-zoning” to single-family and the Pollard plan. 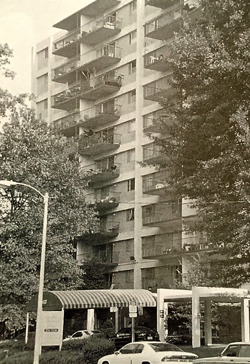 The decision gave residents the boost they desired to continue spreading the “fix-up” attitude throughout the neighborhood and through the 1970s. Combined with the support from the city, the upward trends and excitement of old house renovations brought more new buyers into Central Gardens, an influx not seen since the 1920s, that rejuvenated the neighborhood. 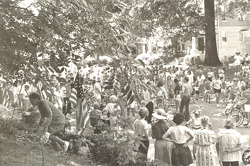 During the pioneering time that was the seventies, “residents formed book clubs, bridge clubs, and the Central Gardeners Garden Club.” And, two of Central Gardens’ most iconic and lasting institutions were established: the Carr Avenue Fourth of July Parade and the Central Gardens Home & Garden Tour. The 1970s were indeed a pioneering time of renaissance in Central Gardens, and laid the foundation for the conflicts that were to come in the 1980s. These conflicts would include mobilizing to deal with encroaching Memphis crime, and the continued battles for more appropriate and compatible land use that would eventually lead to the efforts to establish Central Gardens as a national historic district.